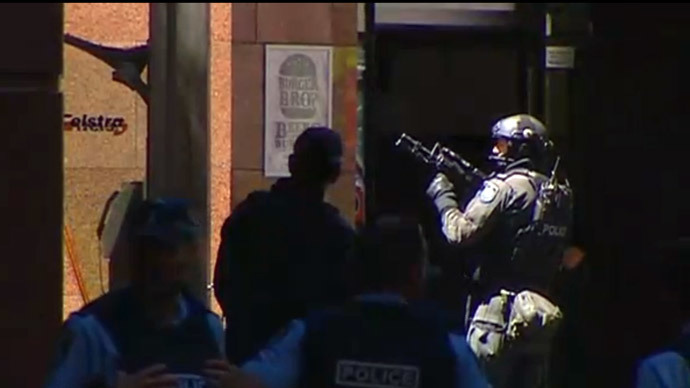 A police operation is underway at a café in central Sydney, where up to 40 hostages are being held by an armed attacker and a black flag with Arabic inscriptions can be seen. Australia is contributing to the US-led operation against the Islamic State. At least five people apparently escaped from the building during a tense standoff between heavily armed police and an unknown number of assailants holding hostages at gunpoint inside the Lindt Chocolate Café in Martin Place. A senior Lindt Australia official said that 10 staff and up to 30 customers could be held hostage. There were “probably 30 customers” at the time of the attack, Sky Business quoted Lindt Chief Executive Steve Loane as saying. The area surrounding the cafe has been sealed off by police, and Australian authorities have cleared the airspace over central Sydney to make way for police helicopters. Live TV footage showed people standing inside the café with their hands pressed against the windows. At least one attacker was caught on camera wearing a traditional Islamic cap. The hostages were forced to hold a black flag with an Arabic inscription, prompting fears that ruthless Islamic State (IS, formerly ISIS/ISIL) militants were behind the attack. Reports on the ground suggest that young women being held hostage in the cafe are being used as a shield, while an attacker is seen pacing around the room. Police said they have made contact with the "gunman," indicating that the assailant likely has no accomplices. The officials refrained from discussing the number of attackers or hostages being held, or possible motives behind the attack. New South Wales (NSW) Police Commissioner Andrew Scipione said the prime goal in the crisis is to keep all hostages safe. He said the police had no information about any injuries. One of the escaped hostages was taken to hospital after being freed, but it was due to a pre-existing condition, the commissioner added. Earlier, Australian 2GB radio host Ray Hadley said that the captor had demanded to speak with Prime Minister Tony Abbott live on the radio. Hadley added that hostages inside the cafe contacted him, but he declined to air their conversation due to safety concerns of those inside the building. Another report claimed that gunmen have explosive suicide belts. Dozens of police, including a SWAT team, were dispatched to the scene, and a couple hundred people were held back by cordons amid the evacuation of nearby buildings. A cafe employee whose shift was about to start told RT that when he got to work, the doors were already locked and he saw a lot of hostages inside. He added that before police arrived to the scene, people thought an armed robbery was taking place. The flag – which appeared different from the one typically used by the IS – was identified as the shahada, or the statement of Islamic faith. The shahada itself only contains the religious inscription “There is no god but the God, Mohammed is the messenger of the God.” It is not directly connected to extremism, although it has been used by jihadist groups over the years. The attack, which took place in Sydney’s central business district, forced nearby buildings in Martin Place – including the Reserve Bank of Australia – into lockdown. The US has evacuated its Sydney consulate, which is close to the Lindt Cafe, Reuters quoted a spokeswoman as saying. Soon after news of the hostage situation emerged, the iconic Sydney Opera House was also evacuated. The move was reportedly prompted by a suspicious package found inside the building. Local authorities put up barricades in front of the Opera House and a police helicopter was dispatched. Riot police arrived at the steps of the building. Around 200 people were instructed to go to the western side of the building, The Australian reported. Witnesses heard security guards saying that a “training event” was taking place. Later police, when asked about a possible bomb threat posed by the assailant or assailants, said they were not concerned about any location other than the Lindt Café itself. Bomb experts have checked potential targets for bomb attacks and cleared them as safe, the police said. Australian Prime Minister Tony Abbott called the situation “deeply concerning,” adding that everything is being done to respond to the incident. “This is obviously a deeply concerning incident but all Australians should be reassured that our law enforcement and security agencies are well trained and equipped and are responding in a thorough and professional manner,” he said in a statement. The PM said the National Security Committee of Cabinet was briefed on the situation and he has spoken to NSW Premier Mike Baird, offering him all possible Commonwealth support and assistance. Shortly before the hostage incident, Daily Mail Australia reported that police had announced an arrest warrant for a 25-year-old man from northwestern Sydney, in connection with a major counter-terrorism investigation. An NSW police spokeswoman said that at this point, the two incidents do not appear to be connected, according to local media. Media speculations connecting the attack to the Islamic State have sprung up, as Australia has been supporting the US-led anti-IS coalition in Syria and Iraq. Back in September, Canberra contributed 600 troops and up to 10 military aircraft to the campaign. In October, Australia launched its first fighter jet mission in Iraq against the IS. “The Super Hornet aircraft conducted an air interdiction and close air support mission over northern Iraq overnight,” the Australian Defence Force said in a statement. Canberra had earlier raised its security level to high, following threats of attacks by radicalized militants. Abbott warned that terrorists may use Australia's commitment to the anti-IS cause as an excuse to target the nation and its citizens. “The reason why we are targeted is not because of anything that we’ve done, but because of who we are and how we live,” the prime minister said.